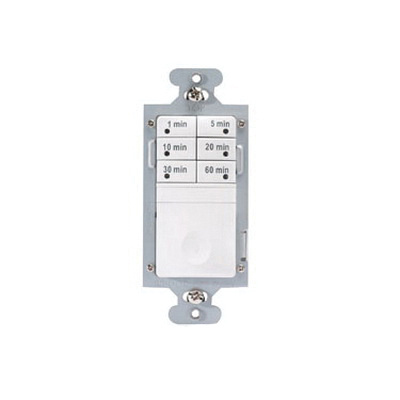 Wattstopper 1-Pole 6 Preset button countdown timer switch with 60-min timing range, has voltage rating of 120-Volt AC and has maximum load rating of 0 - 600-Watt, 1/6 hp motor. This switch has a dimension of 2.63-Inch x 1.69-Inch x 1.88-Inch. It has operating temperature rating of 0 to 55 deg C. This switch supports all decorator wall plates. It is great for controlling lighting in areas such as closets, laundry rooms, pantry and many more. Timer switch is UL/cUL listed and RoHS compliant.